Nigeria is known for their huge and outstanding performance of their veteran athletes in the Masters Games. The African Athletic Masters Championships began in 1994 in South Africa. The Master’s Games ranges from age 35 and above. Each Master athlete has a particular age category he/she falls and competes under. The competition is slated to hold again on Friday 25th to 27th of August 2017 in Abidjan, cote d’ivoire. At the 9th edition of the African Athletic Masters in Limbe, Cameroun last year, Team Nigeria came back home with 39 medals. 30 Gold, 6 Silver and 3 Bronze. Speaking with the Athletic heat, the Secretary of the Nigerian Athletics Masters, Uruemu Adu said that they hope to perform better and come back victoriously just as they did last year. The Nigeria Athletic Masters listed 30 athletes and 3 officials for the African Athletic Masters Championship. In the Long Distance events, for the female category, Edward Mercy and Anetor Irene will participate in the 5000m and 1500m. In the male category, Ishaya Azi will participate in the men’s 10,000m, Seriki Oladipupo for 800m and 1500m and Omoghiboria Clifford for 1500m and 5000m. In the field events, Udjoh Alexander will feature in the Hammer throw, Subaru Yakubu for Javelin, Agbon Emmanuel and Aniemeka Odita Kelvin for Discuss/Shot Put and Okon Richard for Hammer and Shot Put for the male category. In the women’s category, Horsfall Obeleye, John Udumezie Ifeanyi and Iheagwam Chikanele Eurania will feature in the discuss and Shot put throws. Yahaya Kongoila Safaya is the only female who will compete in the 100m and 200m sprint races, while Abimbola Abdulkabir Adeleke, Ofili Michael, Ogunleye Richard, Oyewole Adeboye, Akindamola Taoreed Akin, Ibrahim Idris, Nwokoma Innocent Solomon, Ajiboye Hammed Olusegun and Kalejaiye Adeleke will feature in the men’s 100m and 200m respectively. Master athletes to compete in the men’s 400m are; Akindamola Taoreed Akin, Abubakar Dele, Suberu Yakubu, Seriki Oladipupo and Folawiyo Fatai Aderibigbe. Nigeria will be represented in the men’s sprint relay by Ige Dele, Achi Solomon, Oyewole Adeboye, Niboro Nibson Jade and Aliyu Ibrahim. Other 4×100 athletes are; Nwokoya Innocent Solomon, Ajiboye Hammed Olusegun, Idisi Onome Steady and Esabour Oyerere Reuben. While the men’s 4×400m includes; Ajayi Samuel, Folawiyo Fatai Aderibigbe, Jeriki Oladipupo and Subaru Yakubu. Osifo Linda will participate in the Long Jump and Triple Jump in the female category while Ige Dele and Achi Solomon are for the Long jump and Triple jump in the male category. They will be accompanied by three officials; Aliyu Solomon ASP as team coach, Aliyu Abubakar DCP as team manager and the President Stadia AFMA Uruemu Adu as head of delegation. We wish them all the best as they hope to leave Nigeria for Abidjan on Tuesday 22nd of August 2017. 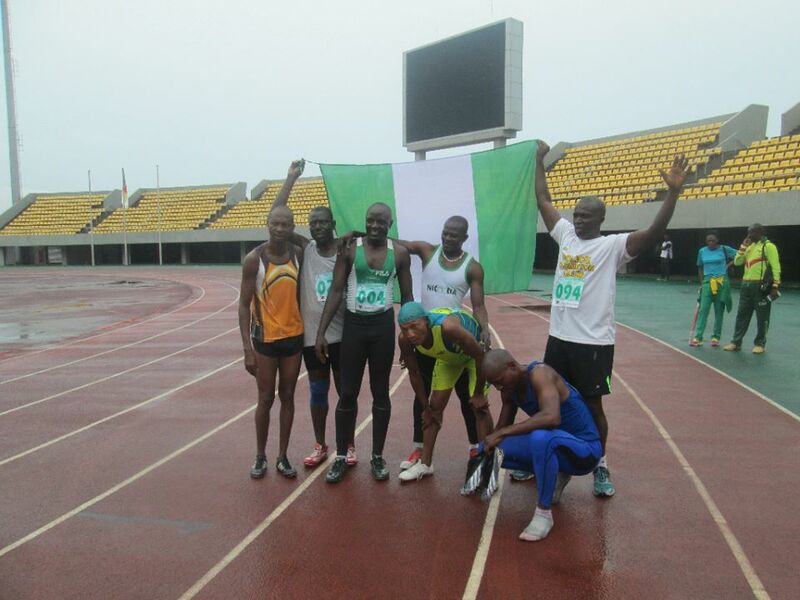 ← IAAF World Relays: Home based athletes out of the Nigerian team! IAAF World Relays: Home based athletes out of the Nigerian team!